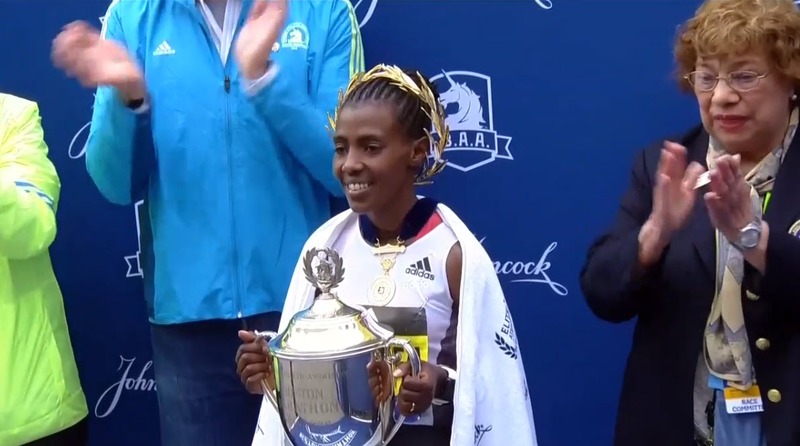 BOSTON — Worknesh Degefa’s class overcame her inexperience, as the Ethiopian built up a lead of 2:59 by 30km (18.6 miles) at the 2019 Boston Marathon and managed to hold on and win in 2:23:31, 42 seconds ahead of a fast-closing Edna Kiplagat of Kenya. Jordan Hasay of the US finished 3rd in 2:25:20 as defending champ Des Linden of the US was 5th in 2:27:00. Degefa, the fourth-fastest marathoner ever thanks to her 2:17:41 in Dubai, ran with the field through a slow opening downhill 5k (17:34), but as the course got flatter Degefa got antsy and started to accelerate. She had a small gap on the field at 4 miles, and then started clicking off sub-5:20 miles. 2012 champ Sharon Cherop and 2015 runner-up Mare Dibaba tried to stay close for a while and they were only 14 seconds back at 10k with the main women’s pack another 15 seconds back. But soon Dibaba and Cherop gave up the chase and Degefa would lengthen the lead by a ton. She led by 1:24 at 15k, 2:26 at 20k, would pass halfway in 1:10:40. From there, she would lengthen the lead further to 2:43 at 25k, and then 2:59 at 30k (18.6 miles) as she was now in the Newton Hills. Victory was hers unless she cracked. However, this was Boston and she still had to navigate Heartbreak Hill and then 5 more miles to the finish. 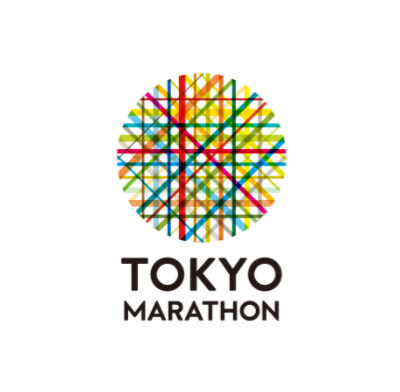 It was only now that the chasers began to cut into her lead as the top 6 chasers, Hasay, Kiplagat, Meskerem Assefa, Biruktayit Eshetu, Caroline Rotich, and Betsy Saina reduced the margin 5 seconds to 2:54 by mile 20. 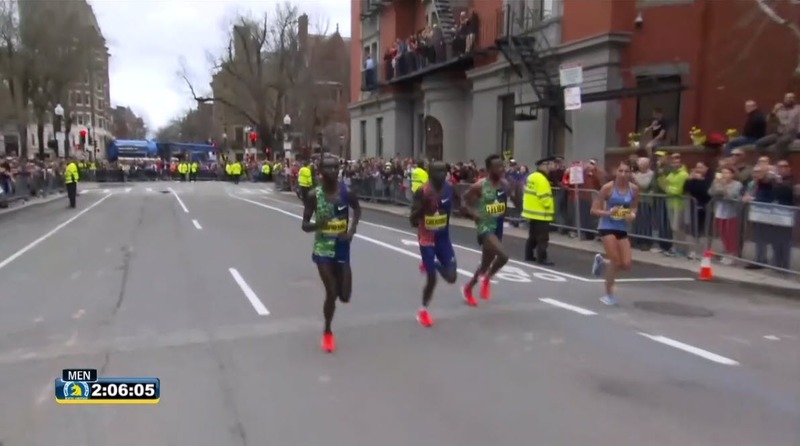 Degefa ran 5:45 and 5:47 for miles 20 and 21 to get the top of Heartbreak Hill still 2:45 ahead of Kiplagat and Assefa. 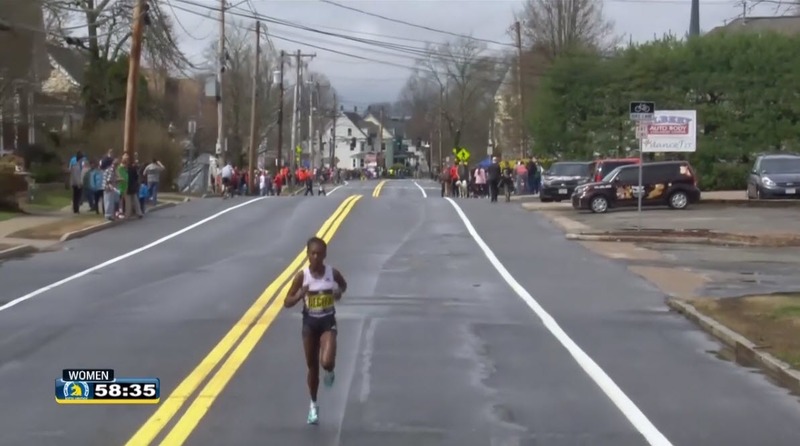 Kiplagat then began to fly down Heartbreak Hill, running with a real sense of urgency as she was chasing Degefa with abandon. Kiplagat would clock the fastest 5k segment for anyone on the course (16:08, which is 2:16:08 marathon pace) from 35k to 40k, but there was not enough room to catch Degefa unless Degefa cratered. 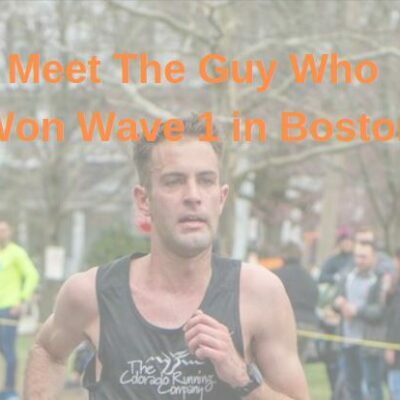 That did not happen as Degefa was running miles in the 5:30s on the downhills and managed a 5:39 for the final mile of the race to ice the comfortable 42-second margin of victory. Full analysis and video interviews appear below the top 20 results. For the majority of this race, Degefa was so far ahead of the chasers that they could not be seen on the TV shots. She looked to be out for a solo training run. Kiplagat really crushed the downhills to get within seeing distance of Degefa but there was no doubting who was best today. 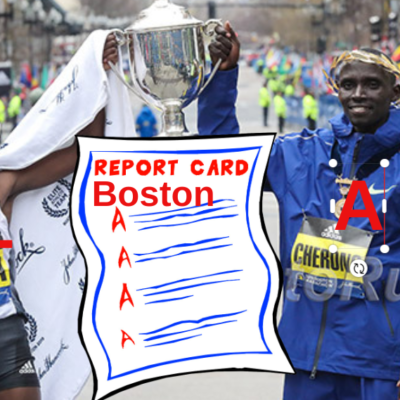 Degefa was the class of the field coming in (the top 5 in the world in the 2018 LRC Marathon rankings are all competing in London later this month), with the only question mark being how would she respond to the uphills and downhills of Boston, and the answer was good enough. If the field had been a little deeper and they had been able to keep the gap a little bit closer, this one might have been more interesting at the end. However give the 39-year-old Kiplagat credit. 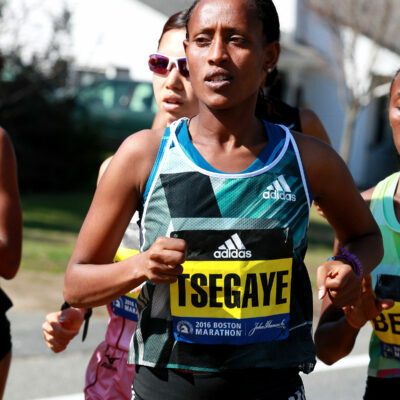 She charged so hard down the hills at the end, it got everyone just to start to wonder if Degefa had enough to get to the finish in time. Hasay and defending champ Linden will rightfully get most of the press, but there was a third American in the top 10, with Lindsay Flanagan 9th in 2:30:07. Flanagan went sub-2:30 in Frankfurt in the fall (2:29:25) and while she just missed sub-2:30 today, more importantly she got the automatic Olympic standard with her top-10 finish. Sara Hall had a disappointing run today in 15th. Last year’s surprise second-place finisher Sarah Sellers was 19th in 2:36:42, just off her PR of 2:36:37 last year in New York. 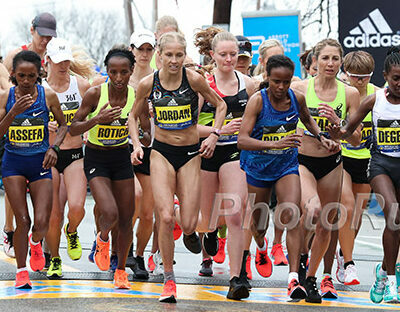 Sellers, who was passed by the leading men late in the race despite her 28-minute head start, had a knee injury that bothered her today. American Sally Kipyego of the Oregon Track Club was one of the most credentialed runners in the field with Olympic and World silver medals at 10,000m and a runner-up finish at the 2016 New York City Marathon. However, all of those accomplishments were before the birth of her daughter Emma 20 months ago (Sally was pregnant when she ran NY but didn’t know it). Coming back from childbirth has been very hard for Sally, but she said she was fit and ready to run at Boston, but a calf issue that started bothering her in Boston in combination with the tough hills on the “deceivingly hard” course, took their toll and she dropped out around 18 miles. Kipyego said she just couldn’t run the downhills. Kipyego was only 5 seconds behind the chase group at the halfway mark, but the gap increased to 53 seconds at 25k, and she didn’t make it to 30k. Sally said it was “A bad day in all kind of ways. I had an awful day. To say I’m heartbroken is an understatement. I wasn’t even doing it for me. I was doing it for so many people. I feel like for this buildup, it meant so much more because there were so many people who helped me because I struggled a lot to come back. There were people who took care of me and took care of my family. I wanted to do it for them because I felt if I did well they would somehow be rewarded. Today I kind of disappointed them in a way because how do they get rewarded? Boston wasn’t even for me… deep down it was for other people,” she said. 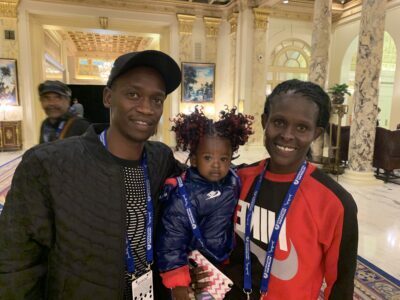 Kipyego said aerobically she felt “fantastically” today and besides letting others down felt the biggest disappointment was her performance not reflecting that work. ”I feel like I’m in a good place and I know today is not showing that but I know I have done the work,” she said. 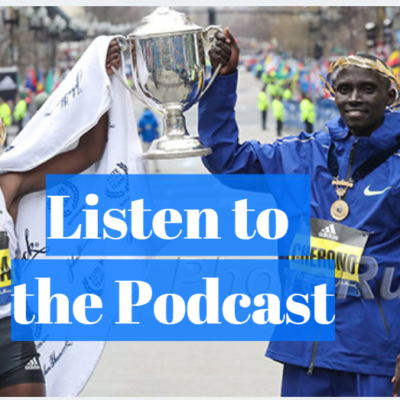 “I just wanted to get a good marathon before the Trials,” Kipyego said. 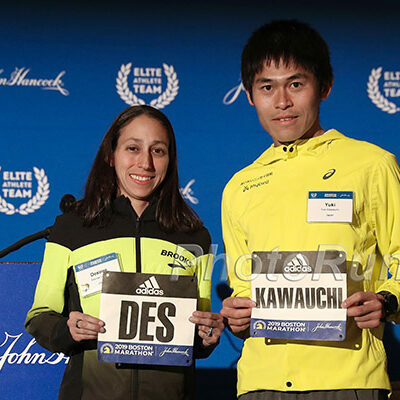 She will not do another marathon before the Olympic Trials and wants to do shorter stuff to regain her speed and work on making her body strong. She said she needs to get in the gym to strengthen her body. The running part feels good she said, but her body isn’t quite where it needs to be and she even has struggled with her immune system. She’s got 10 months before the Olympic Marathon Trials.